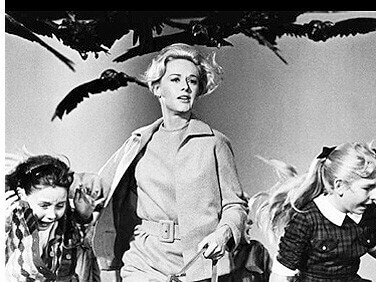 Tippi Hedren was all set to be a major film star when she made her first picture, The Birds, for famed director Alfred Hitchcock. It didn’t turn out that way. Hedren was always a beautiful girl, and she grew up to be a stunning blonde woman. Born in Minnesota January 19, 1930, her heritage is Swedish, German, and Norwegian. Her interest in fashion began when she was a teenager and she appeared in local department store shows. When she turned 20 in 1950 and was a gorgeous young woman, she decided to move to New York and try her luck on the runways of the fashion houses as well as do modeling to support herself. She was quite a success appearing on television commercials and in magazines for a decade. Her first marriage was to Peter Griffith in 1952. Their daughter, future film star Melanie Griffith, was born August 9, 1957. Hedren divorced Griffith in 1961. Although slightly older than most movie starlets, her luck changed when Hollywood’s iconic macabre director Alfred Hitchcock saw her in a television commercial. They met on October 13, 1961 to discuss a film Hitchcock had in mind for her. She thought he wanted her for a television series because they never discussed the movie. Hitchcock had a penchant for ladylike blondes. The ‘cool’ blondes he cast in his films were Grace Kelly, Vera Miles, Doris Day, Carole Lombard, Marlene Dietrich, Eva Marie Saint, Janet Leigh, and Madeleine Carroll among others. Tippi was to join that group of lovely actresses when she signed a seven-year personal contract with Hitch. Little did she know what was in store for her. In a sense, Hitchcock ‘owned’ Hedren because she was obligated to a personal contract and not one with a major studio. Hitch more or less took over her life, had famed designer Edith Head make clothes for her, and he taught her the table manners of a Queen. Shooting on The Birds was hectic and exhausting because of working with the mechanical animals. Hitchcock watched every move she made and isolated her from other cast members (Suzanne Pleshette, Rod Taylor). He was almost like a Svengali character in her life and during the making of the film. Hedren was most uncomfortable when he made sexual advances toward her and made it known he wanted an intimate relationship. She rebuffed all his unwanted overtures. Hedren once said “it was embarrassing and insulting.” She even complained to Universal Studios boss Lew Wasserman about the events, but nothing was done. It didn’t matter because the movie became a huge hit and established Tippi as a new star on the horizon. Her personal life took a turn for the better when she married producer Noel Marshall on September 22, 1964. Still under personal contract to Hitchcock, Hedren was cast in Marnie (1964), a psychological thriller co-starring Sean Connery. According to Hedren, her director’s behavior became even more blatant and suggestive during the shooting. Hedren begged to be let out of her contract, but Hitchcock said no and kept her off the screen for two years because of her unwillingness to give in to his demands. It nearly ruined her career. He sold her contract to Universal Studios in 1966, and Hedren was free to pursue her career once again. Silent screen giant Charles Chaplin was directing Countess From Hong Kong (1967) and wanted Hedren for a part in the film. Hedren was to co-star with Sophie Loren and play Marlon Brando’s wife. Disappointingly, her part was merely a large cameo, but she enjoyed working with Chaplin. Hedren was cast in more movies such as Tiger By The Tail (1968) and two films shot in Africa, Satan’s Harvest and Mister Kingstreet’s War in the early 70s. Her daughter Melanie Griffith’s future husband Don Johnson co-starred with Hedren and James Whitmore in 1973’s The Harrad Experiment. To fill in the gaps between film assignments, Hedren appeared on many top television shows such as The Courtship of Eddie’s Father with Bill Bixby, Hart to Hart with Robert Wagner, Return to Green Acres with Eva Gabor, Perry Mason, Murder She Wrote with Angela Lansbury, and many others from 1965 through 1997. It wasn’t until 1981 that Hedren appeared on the big screen again. 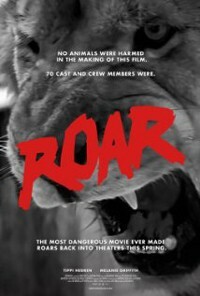 She and her husband Noel Marshall produced the film Roar, about an animal research park that featured ferocious wild cats. It was a difficult shoot and many people were injured. However, it sparked the idea for Hedren to establish the non-profit Shambala Reserve and Roar Foundation in the Santa Clarita Valley just north of Los Angeles. It is there Hedren is caretaker for many wild tigers and lions. Hedren only worked when she wanted to as the animal preserve kept her fairly busy. In 1982 she appeared before the film cameras with Leslie Nielsen in Foxfire Light with future Oscar® winner A. J. Simmons and Barry Van Dyke. In 1985 she met and married steel tycoon Luis Barrenechea. They remained together for ten years and divorced in 1995. The Bold and the Beautiful was a hit daytime soap opera, and Hedren was a member of the cast for two years, from 1990-1991. She managed to squeeze in a part in Pacific Heights in 1990 with Michael Keaton and her daughter Melanie Griffith. Laura Dern co-starred with Hedren in 1996 in the political satire Citizen Ruth from director Alexander Payne. Hedren played an abortion rights activist. It was a hit movie and solidified Hedren’s movie presence. Two years later she co-starred with Christina Ricci and Andrew McCarthy in I Woke Up Early The Day I Died. Hedren was engaged to Martin Dinnes from 2002 until 2008. He was a veterinarian interested in helping her with the animal preserve. Television gainfully employed her in such series as Chicago Hope (1998), Fashion House (2006) with Bo Derek, CSI: Crime Scene Investigation (2008), Tribute (2009) with Brittany Murphy, Batman: The Brave and the Bold (2011), Raising Hope (2012) with daughter Melanie, Free Samples (2012) and Cougar Town (2013). Still an exceedingly beautiful and poised woman at age 84, she continues her important work on her 80-acre animal preserve and appears occasionally on television. Contributions may be made to the non-profit Shambala Preserve for the care and feeding of the animals.